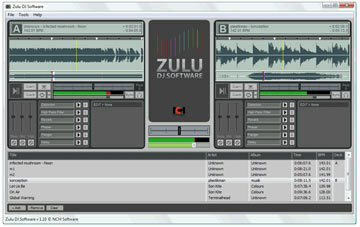 Zulu Virtual DJ Software Pro is a DJ program for Windows. It lets you mix music and other audio recordings live. When loading a music track onto a deck Zulu will automatically scan the file for a beat and assign a beat per minute (BPM), and will change the tempo in the second deck for perfect synchronization. Drag and drop music into and around Zulu's interface and preview an upcoming track through headphones via a secondary audio output. ...... deck for perfect synchronization. Drag and drop your music anywhere in Zulu DJ Software, and preview upcoming tracks before they play. Zulu DJ Software also supports all the latest audio file formats so playing your music is never a problem. Qweas is providing links to Zulu Virtual DJ Software Pro 2.31 as a courtesy, and makes no representations regarding Zulu Virtual DJ Software Pro or any other applications or any information related thereto. Any questions, complaints or claims regarding this application Zulu Virtual DJ Software Pro 2.31 must be directed to the appropriate software vendor. You may click the publisher link of Zulu Virtual DJ Software Pro on the top of this page to get more details about the vendor.